Good evening everyone! I hope you have had a wonderful weekend! 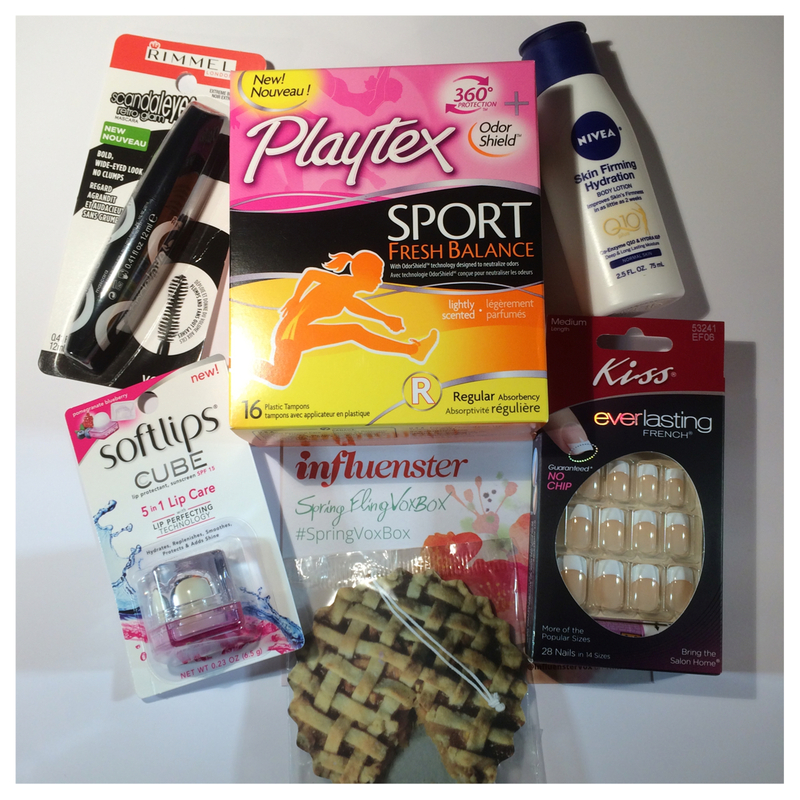 Today I am going to share a quick glimpse of the new Influenster Spring Fling VoxBox. If you haven’t heard of Influenster then you are going to love today’s post. Influenster is a community of trendsetters and social media gurus that just love trying out new products and sharing their opinions with the world. They are always sending out samples to selected users to get their opinion. The Spring Fling VoxBox was full of goodies that I am certainly looking forward to trying out. This VoxBox was full of great items. I received Rimmel London Scandaleyes Retro Glam Mascara (retails for $5.99), Kiss Everlasting French Nails (retails for $6.49), Playtex Sport Fresh Balance tampons (retails for $3.99 to $4.99), NIVEA Skin Firming Hydration Lotion (retails for $2.49 for 2.5oz/$10.99 for 13.5oz), Softlips Cube (retails for $3.49), and a Peach Pie Car Airfreshener inspired from the movie Labor Day. I will certainly be testing these guys out for the next few weeks and will be back to share my final review of each product. I will say I am most excited about the Rimmel London Mascara and NIVEA Skin Firming Hydration Lotion. Both seem perfect for the upcoming Summer months. These products were sent to me for review purposes but does not influence my final review. I love the air freshener! I’ve got the TLC Vox Box on its way to me. Hopefully it’s awesome! Awesome! I hope it is an awesome box!